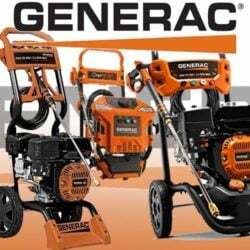 Generac - Find The Best Pressure Washers Brand! The company founded in 1959 and was the first to engineer affordable home standby generators. It is now the number one manufacturer of home backup generators. They expanded their business and started making power washers later. The company mainly makes pressure washers, generators, transfer switches, water pumps, AC power inverters, tools, and accessories. The company has a good reputation in making pressure washers. Generac has a commitment to develop environmentally responsible products, processes, and partnerships. The company welcomes the organizations for partnerships and shareholders for developing the sustainable technology. They make gas pressure washers. The device features its products nicely with all the modern facilities. Their pressure washers are very well known in the market. They are expert in making gas powered residential pressure washers. You will find that their products are pretty powerful that helps to clean the heavy duty filth and dirt. In almost all their products they used a strong frame for the products’ durability. Their OHV horizontal shaft motors and pumps also are made with strong metal. You can call Generac in the given number, 888-436-3722.